Thursday Island, a small island in the Torres Strait, is the administrative centre of all the Australian islands between Cape York and the New Guinea mainland. It is situated in the Prince of Wales Island group, or the Inner Islands, 35 km north-west of Australia's northern extremity, Cape York. Its area is about 4 sq km. The Torres Strait Islander name is Waiben. The origin of the name 'Thursday' is obscure, perhaps bestowed by William Bligh or Owen Stanley. There are also Wednesday and Friday Islands in the Prince of Wales Group. The first place of permanent European settlement in Torres Strait was Somerset, south-east of the Cape York tip, sheltered by Albany Island. Queensland's Governor, Sir George Bowen, proposed the establishment of a port at Cape York and news of the massacre of castaways of the Sapphire in 1860 reinforced the urgency for a permanent European presence. Somerset was the result, occupied from 1864 until 1877. 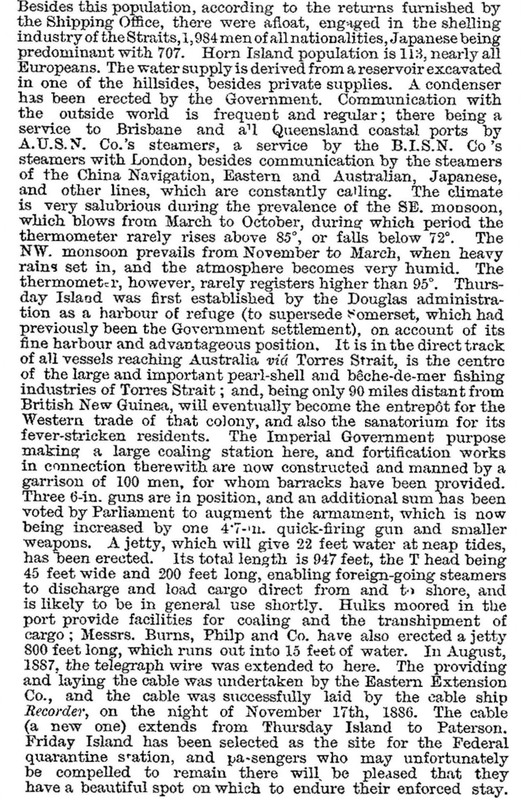 An unforeseen disadvantage was the hazardous tidal channel between Albany Island and Somerset and in 1875 it was jointly decided by the Queensland and British governments to transfer the port to Thursday Island, which had a safe and deep anchorage on its south side. Three years earlier, Queensland had unlawfully annexed most of the Torres Strait islands for defence purposes. The concentration of government attention on the Strait had mixed motives: Queensland believed that whoever controlled Torres Strait controlled Queensland's lifeline to Britain; British shipping interests were concerned to ensure adequate supervision of increasingly busy shipping lanes; and both were concerned about the use of Pacific Island labour, Queensland wanting islanders for sugar plantation work, rather than losing them to the pearl shell industry in Torres Strait. In 1878 Port Kennedy, Thursday Island, was settled and the following year the Government Resident was given control of all the islands in Torres Strait. Firms employing Pacific Islanders to harvest pearl shell and bêche-de-mer were subject to regulation by the Resident. 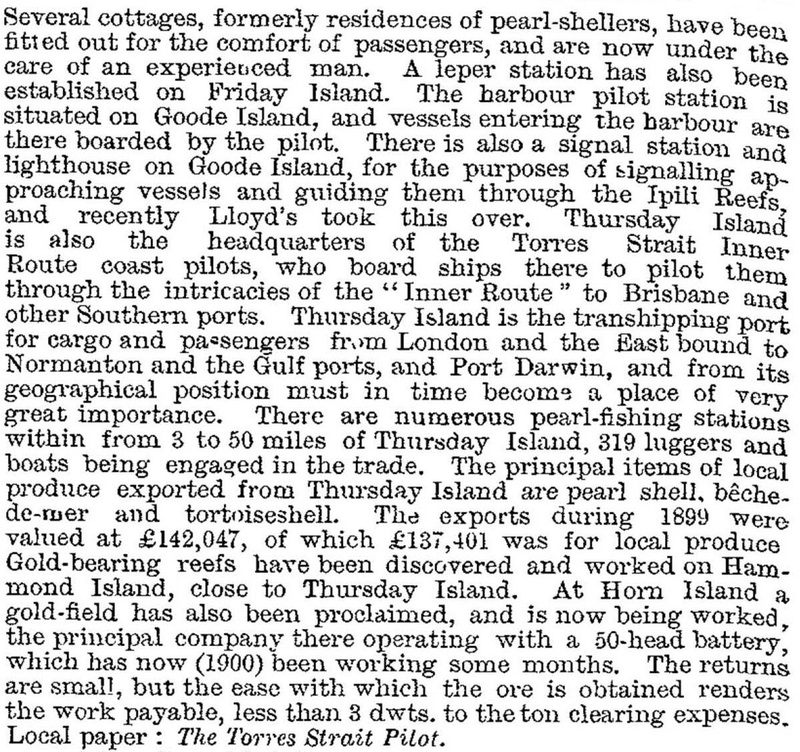 In 1880 a direct steamship service began from England to Australia via Torres Strait, and by 1885 two hotels on Thursday Island attended to travellers' needs. The European population until then was small, but land sales allowed from 1885 soon led to a considerable increase in numbers. A customs house was built in 1885 and a telegraphic connection with the mainland was made in 1887, and a quarantine station was installed on Gialug Island a few kilometres to the west. The hazards of Torres Strait for shipping came to public attention in 1890 when the Quetta sank east of Thursday Island with the loss of 133 lives. The few bodies recovered were buried at Thursday Island, and a memorial church was built there in 1893-96. It is now the Anglican Cathedral for the Diocese of Carpentaria, claiming to be the world's smallest cathedral. The island was a coaling station for shipping, quarantine point, pearl shell industry headquarters and, in 1892, a place of fortification, with a gunnery at Green Hill at the eastern end, protecting entry to Port Kennedy on the south-east shoreline. The fort was decommissioned in the 1920s. Government industries - harbour, customs, jail, post and telegraph, garrison, police - were an important component of the island's economy, and the private sector was dominated by pearl shell. Boats working out of Thursday Island were estimated to employ over 2000 men, about one third of whom were Japanese divers. On the island itself, the population in 1903 comprised 736 Australians, British and Continental Europeans, 334 Japanese and 445 'other races' including Melanesians, Aborigines, Filipinos, Chinese and Malays. Many Aborigines and Islanders were not counted in local or colonial censuses. The population included itinerants, probable absconders and others outside the law, earning the island the opprobrium of 'sink of the Pacific'. On the other hand, the island was a self-contained centre with a wide range of commercial and civic amenities. The main street had Japanese and Chinese stores. The commercial sector included a Burns Philp store (since 1887), aerated water makers, boat builders, cabinet makers, a photographer, printers and tailors. 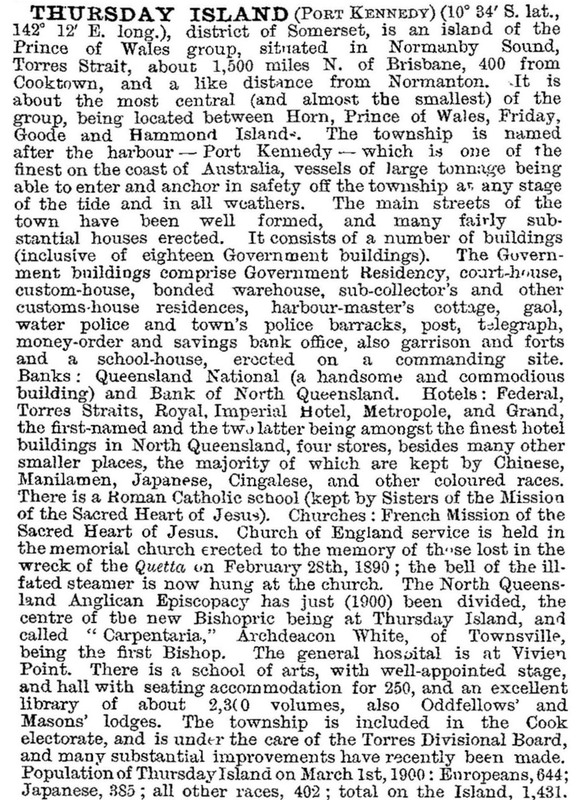 Civic amenities included a town council (1885), the Sacred Heart Convent school, a school of arts, a hospital (1910) and the Carpentaria Diocesan administration. There were also six hotels. The war time internment of Japanese and the emigration of Malays because of the cessation of pearling was more than counterbalanced by the influx of islanders: Thursday Island's population grew from 944 to 2062 during 1947-54. They entered a vigorous pearl shell industry, which continued to prosper until the 1960s when plastics replaced shell. The value of harvested shell declined by 80% during 1956-70. A cultured pearl industry was afflicted by oil spills and disease in the 1970s, but Japanese pearl farms established in the 1960s continued business. Unemployment became endemic, but fishing and crayfishing helped to take up some of the labour force. Today the island has a live crayfish industry, exporting to Asia; cultured pearl farms continue to prosper on nearby islands, and many Islanders find employment in the federal, state and local government instrumentalities and departments serving both Thursday Island and the other populated islands in the Torres Strait group. The island has maintained its varied retail and commercial sectors, along with a TAFE, high school (1966), State primary school, the Patrician Brothers school and the Sacred Heart school. Victoria Memorial Institute Hall (1901) was demolished in the 1990s to make way for new council chambers. Most of the main public buildings on the island have been built or rebuilt in the last two decades to withstand cyclones, including the Gab Titui Cultural Centre (2004) and the Court House (2005). The Thursday Island hospital provides vital medical care for the whole Torres Strait island group, as the nearest Base Hospital is at Cairns, 850 km away. The Japanese cemetery is on the Australian heritage register. There is an identifiable 'suburb' of Tamwoy at the island's north-west end, built in the 1950s when many islanders moved there. Thursday Island has four sites on the Queensland heritage register: the Our Lady of Sacred Heart Catholic Church complex, the earliest building dating from 1885; the Quetta memorial precinct, Douglas Street, including the Anglican cathedral; the cemetery complex; and an elegant two-storey customs house (1938) in Victoria Parade. In 1997 two windmills were erected on the Island, providing about 10% of the power requirements. Most visitors coming to Thursday Island and residents returning from the mainland fly from Cairns to Horn Island, a 30 minute ferry trip away from Thursday Island. There is a great deal of local travel between the islands and to Cape York, mostly in smaller boats, weather conditions permitting. At the 2011 census 64.6% of residents were recorded as Aboriginal and Torres Strait Islander people.